Owing to our rich industry experience, we are offering best quality Fancy Kurti to the customers. We offer our clients a wide range of Fancy Anarkali Kurti, Fancy Designer Kurti, Fancy Red Green Anarkali Kurti and Black Fancy Long Kurti under this category. Designed in compliance with the latest fashion trends, these kurtis are ideal to be worn for casual meetings, parties and functions. 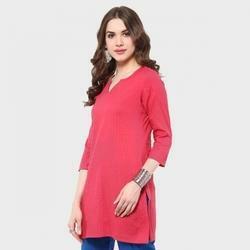 The kurtis we offer to the customers help in enhancing their overall personality. Leading Manufacturer and Exporter from Jaipur, Pintuck Kurtis.We are a distinguished name in this domain, engaged in offering Cotton Pintuck Kurtis to the clients.